The typical survey course in psychology has time for only limited presentation of the research on which our knowledge is based. As a result, many students come away with a limited understanding of the role of experiments in psychological science. Where do experiments come from and how are they conducted? What are the pitfalls and how can we avoid them? What advantages do they have over intuition, authority, and common sense as guides to knowing and acting? What distinguishes research-based psychology from psychobabble? What have we learned from experimentation in psychology? 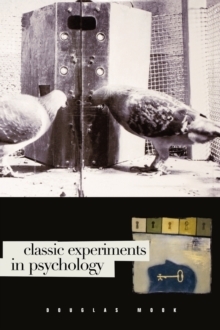 This book presents, in more depth than textbook treatment permits, the background, conduct, and implications of a selection of classic experiments in psychology. The selection is designed to be diverse, showing that even for research in vastly different areas of study, the logic of research remains the same-as do its traps and pitfalls. This book will broaden and deepen the understanding of experimental methods in psychological research, examining where the research questions come from, how questions can be turned into experiments, and how researchers have faced the problems presented by research in psychology.